Just about every packaged thing in the grocery has a starburst on it, calling your attention to the dazzling health benefits of the food inside. I'm nicknaming them health halos—and they're blinding! Just about every packaged thing in the grocery store has a starburst on it, calling your attention to the dazzling health benefits of the food inside. I'm nicknaming them health halos—and they're blinding! 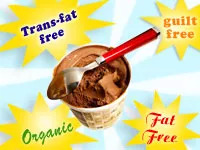 Words like "trans-fat free," "live cultures," "omega-3," "vegan," and "organic" make us overlook the fact that these things have calories, fat, and sugar. Put out some "low-fat" candy and people will eat up 28 percent more than if regular candy were served. Sure, 100-calorie snack packs seem harmless, but research shows many dieters eat a few too many 100-calorie packs in a day, sabotaging their goals. And remember the "SnackWell's Syndrome" of the '90s, at the peak of the low-fat craze? People ate entire boxes of that company's Devil's Food Cookie Cakes in one sitting. I did a little informal survey of a few friends and my colleagues here at Health and found that more than a few of us are blinded by health halos, letting ourselves dive deep into good stuff: Brownies made from fat-free mixes; bags of low-fat, gluten-free, baked cheese curls; and entire pints of low-fat fro-yo. Nuts are a source of heart-healthy unsaturated fats, and they can help manage metabolic syndrome. But I don't know how healthy they are the way Sean Kelley eats them. He tells me he can polish off cups of cashews and pistachios at a time: "I eat until my tongue melts off from the salt. Then I get ice cream or a Diet Coke to fix the salt problem." An ounce of nuts is 160 to 200 calories, depending on the type. A cup of cashews? 786 calories—and 63.5 grams of fat. One serving (about 10 chips) is 140 calories. An entire bag is 840 calories. Dinner and dessert are sensibly skipped. It's not the food itself that's the diet wrecker—it's the amount we munch. And if you think Health editors aren't prone to overeating, think again. Read more hilarious stories about our editors' guilty pleasures. Got any healthy irresistible faves to add to the list? Leave me a comment.